Sitting in the splash zone during an orca performance can easily be the highlight of any child’s trip to SeaWorld. Unbeknownst to a five-year-old, the seemingly happy-go-lucky whale swimming before them has been taken out of its natural habitat, dumped into a minuscule chemical-infused pool and suffers the heartache of living a life, trapped until death. At least some people are aware of the cruelty behind the fake façade, money-hungry, establishments portray to their audiences. Assemblyman Richard Bloom (D-Santa Monica) recently proposed the California Captive Orca Welfare and Safety Act that would put an end to performance-based entertainment for all orcas throughout the state. Why stop there? Orcas are not the only marine mammals forced into this life-threatening situation. There are dolphins, seals, sea lions and walruses tormented day after day due to the lack of laws forbidding animal cruelty in such circumstances. This needs to change. In an interview with The Star, former Marine Land of Canada trainer Phil Demers reveals the deterioration of animal health he witnessed in the 12 years of his employment. He said that due to the chemicals used to maintain the water, skin would constantly flake off the dolphins, sea lions were unable to open their eyes and necessary injuries treated out of water just harmed animals’ personalities. He even saw the projection of a sea lion’s eyeball out of its socket and onto the floor before he called it quits. The cruelty just keeps going. Before an animal can even spend the rest of its life in the equivalency of a jail cell, it needs to be taken away from its family as a juvenile so it has the ability to be trained, reproduce and have a longer life span in show biz. Gail Woon, another former trainer, who previously worked for the Underwater Explorers Society, is now an anti-captivity activist due the brutality she witnessed. In a letter Woon wrote to Tribune242, she said that the capturing process includes netting at least 60 dolphins, just to steal a few and the ones released back into the ocean suffered injuries, broken fins, drowning due to the lack of available water and even death. She continued to say that during training she was forced to starve the helpless mammals by throwing their meals on the opposite side of the clear wall so it could only be seen, not eaten. This is not a cry from an animal activist but the truth behind an issue that a majority of the population is unaware of or ignorant to. How would you like to spend your whole life submerged in a chlorinated pool with no goggles, eating thawed frozen fish and acting like a monkey in front of an obnoxious screaming audience? If this doesn’t seem horrendous, you deserve to switch places with the abused marine mammals stuck in SeaWorld. While Bloom should be praised for his initiative to cease orca performances, the issue goes beyond just killer whales. Action needs to be taken for the voiceless seals, sea lions, dolphins and walruses that are involuntarily victims of animal cruelty. A simple step can be to deliberately avoid such shows or take a minute of your day and sign a petition that will go toward stopping the atrocity marine mammals endure in our society. Does anyone really think that these captive orca programs can go on indefinitely in the United States? I don’t. SeaWorld (and the rest) must break from the past, reinvent itself, and become something new. 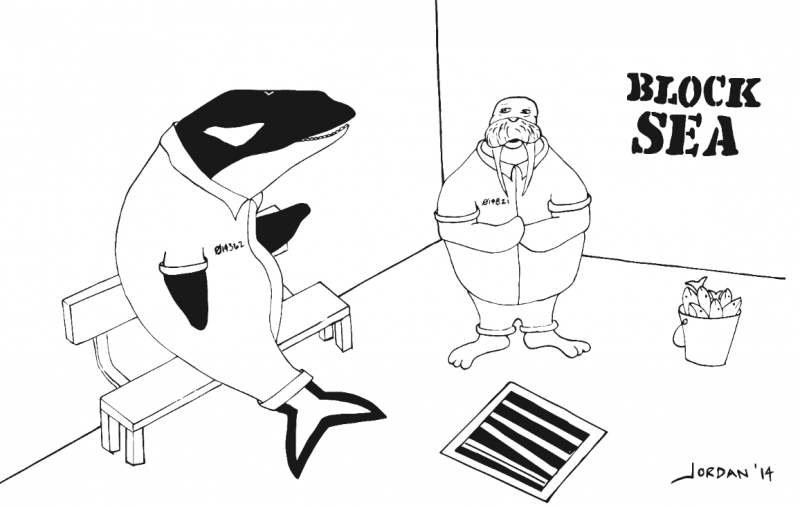 Support the Orca Welfare & Safety Act in California. Protect the wild ones. Say NO to orcas in captivity for our entertainment.